JUSTIN’S PICK :: THE BOJEFFRIES SAGA GN: Alan Moore is a pretty divisive presence in the funnybook sphere nowadays; the only people more vociferous than his fans seem to be his detractors. So I – fish nor foul – often feel a little lonely, being a moderate fan of the guy (i.e. I love his work, could care less about his personality). This book collects some old Warrior strips with Steve Parkhouse (plus a new installment to bring the family’s exploits into the present day). 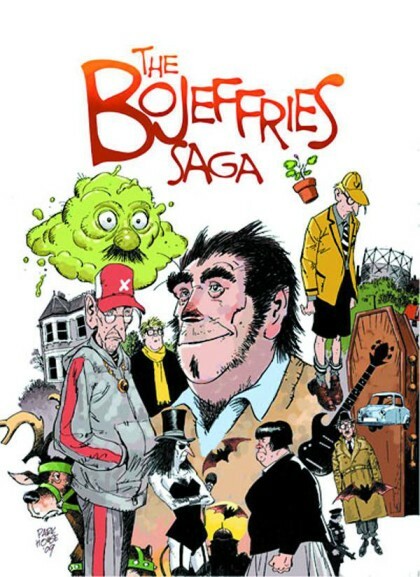 The Bojeffries Saga is billed as a mash-up of the Addams Family and Coronation Street, creepy, quintessentially British, all at once. Anglophiles note. BONUS PICK :: INSECT BATH #1: This Fantagraphics anthology had me at the word “insect”. Ever since childhood, bugs have been a consistent fount of fascination. Combined with a healthy appreciation for the horror genre, well, it’s easy to see why I’m losing four bucks to this one. Dig that nutso cover.